If you're out and about minding your own business only to notice the striking presence of a black squirrel, don't assume you've discovered a new species. Black squirrels are technically eastern gray squirrels (Sciurus carolinensis) or fox squirrels (Sciurus niger), only in melanistic phases that lead to higher amounts of pigmentation than normal. Genetic mutations can cause eastern gray squirrels to have fully black fur, or at least mostly black fur. Occasionally, eastern gray squirrels in black phases can have loosely distributed white or gray spots all over their bodies, too. It generally is easy to distinguish between eastern gray and fox squirrels in black phases, as black fox squirrels are usually characterized by white noses and ears. Black fox squirrels also are caused by genetic mutations. Coloring differences aside, fox squirrels are typically markedly bigger than eastern gray squirrels. 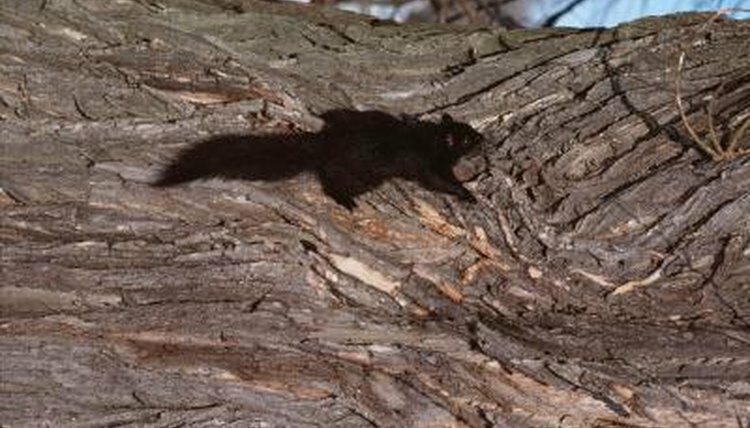 Eastern gray squirrels in melanistic phases can occur anywhere that other members of the species normally do, with a range that includes southern Canada and the eastern region of the United States. They live everywhere from Florida to Quebec. However, black varieties of the species are especially prevalent in the northern portions of the scope -- think New England, for example. Like eastern gray squirrels, fox squirrels are abundant in the easterly locations of the United States. They also live in parts of eastern Canada, as well. However, black fox squirrels are especially numerous in the southeastern section of the United States, specifically states such as Georgia, South Carolina and Florida. Although not all fox squirrels have black coats, the scientific name of the species contains a nod to the individuals of the black phase variety. The word "niger" means black in Latin. The name came about due to an early sighting of a fox squirrel by Swedish zoologist Carl Linnaeus. The specific squirrel Linnaeus saw just happened to be a black phase specimen. Fox squirrels appear in colors other than black -- think grayish-orange, reddish-beige, grayish-brown or deep orange. The upper portions of their ears are usually notable paler than other parts of their bodies.